Bacteria can enter the innermost part of the tooth through either a deep cavity or a chip or crack in your tooth. The resulting infection and inflammation can cause an abscess at the tip of the root. A tooth abscess is a pocket of pus that's caused by a bacterial infection. The abscess can occur at different regions of the tooth for different reasons. A periapical (per-e-AP-ih-kul) abscess occurs at the tip of the root, whereas a periodontal (per-e-o-DON-tul) abscess occurs in the gums at the side of a tooth root. The information here refers specifically to periapical abscesses. See your dentist promptly if you have any signs or symptoms of a tooth abscess. If you have a fever and swelling in your face and you can't reach your dentist, go to an emergency room. Also go to the emergency room if you have trouble breathing or swallowing. These symptoms may indicate that the infection has spread deeper into your jaw and surrounding tissue or even to other areas of your body. Dry mouth. Having a dry mouth can increase your risk of tooth decay. Dry mouth is often due to the side effect of certain medications or aging issues. A tooth abscess won't go away without treatment. 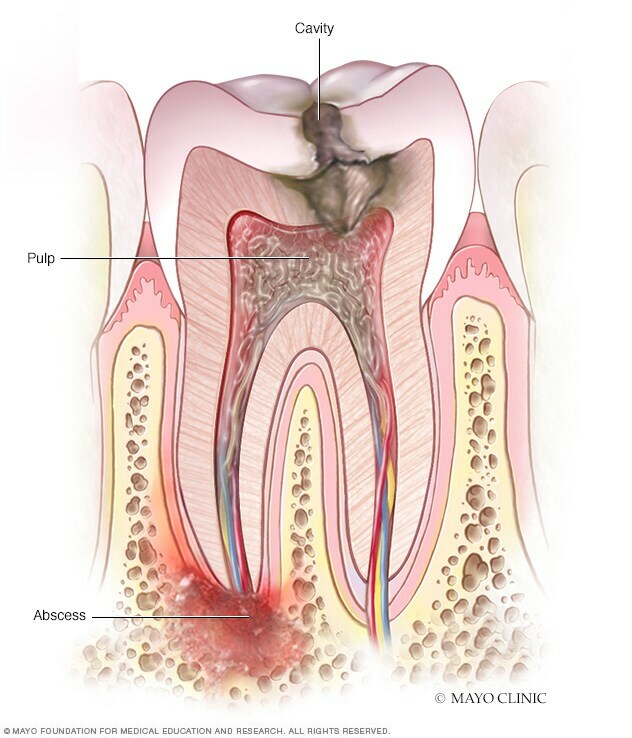 If the abscess ruptures, the pain may decrease significantly — but you still need dental treatment. If the abscess doesn't drain, the infection may spread to your jaw and to other areas of your head and neck. You might even develop sepsis — a life-threatening infection that spreads throughout your body. AskMayoExpert. Dental abscess. Rochester, Minn.: Mayo Foundation for Medical Education and Research; 2019. Dental hygiene. Centers for Disease Control and Prevention. https://www.cdc.gov/healthywater/hygiene/dental/index.html. Accessed Jan. 21, 2019. Home oral care. American Dental Association. https://www.ada.org/en/member-center/oral-health-topics/home-care. Accessed Jan. 21, 2019. Toothache and infection. Merck Manual Professional Version. https://www.merckmanuals.com/professional/dental-disorders/symptoms-of-dental-and-oral-disorders/toothache-and-infection. Accessed Jan. 21, 2019. Abscessed teeth. American Association of Endodontists. https://www.aae.org/patients/dental-symptoms/abscessed-teeth/. Accessed Jan. 21, 2019. Root canal treatment. American Association of Endodontists. https://www.aae.org/patients/root-canal-treatment/. Accessed Jan. 21, 2019. Tooth decay. National Institute of Dental and Craniofacial Research. https://www.nidcr.nih.gov/health-info/tooth-decay/more-info. Accessed Jan. 22, 2019. Bertossi D, et al. Odontogenic orofacial infections. Journal of Craniofacial Surgery. 2017;28:197. Robertson DP, et al. Management of severe acute dental infections. BMJ. 2015;350:h1300. Toothbrushes. American Dental Association. https://www.ada.org/en/member-center/oral-health-topics/toothbrushes. Accessed Jan. 22, 2019. Salinas TJ (expert opinion). Mayo Clinic, Rochester, Minn. Jan. 28, 2019.